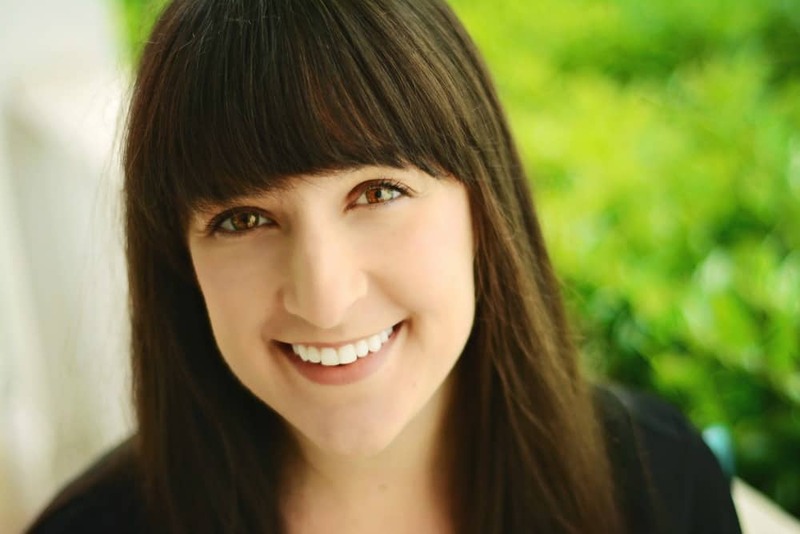 July 19, 2017 By Liz 33 Comments Note: This post may contain affiliate links. This post is sponsored by Minute® Ready to Serve Organics, and I’m so excited to share their latest products with you! When I get home from work, I’m hungry. As much as I love making dinner, sometimes I’m just ready to eat and I don’t want to spend a lot of time prepping, chopping, and cooking. That’s when I look for shortcuts. 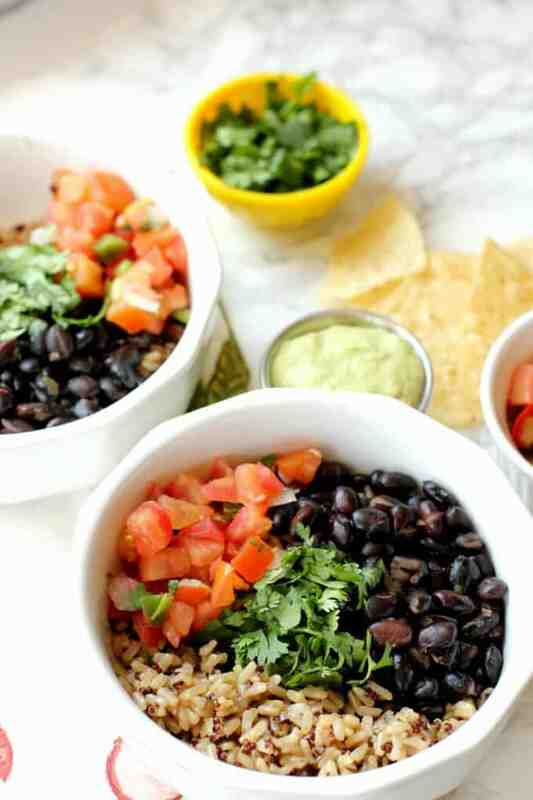 These burrito bowls only take a few minutes to throw together so you’ll have dinner ready in no time! I’ve used Minute Ready to Serve rice before (try this stir fry recipe!) but I was really excited to find out that they now have a brown rice and quinoa blend! 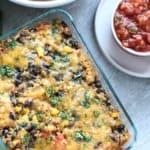 As much as I love quinoa, I don’t always think to make it ahead of time, so it’s nice to be able to have these microwaveable bowls for a quick and easy meal! They’re in single serving cups so it’s also great if you want to bulk up a leftover lunch or you’re making dinner for one! Honestly, one of these cups would be perfect topped with a fried egg and some avocado in the morning! 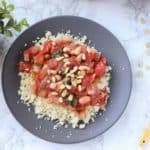 For this particular recipe, I used the Minute® Ready to Serve Organic Red Quinoa and Brown Rice with Garlic which is a blend of organic red quinoa and brown rice with a little garlic and onion. It is 100% whole grain, a good source of fiber and gluten free. 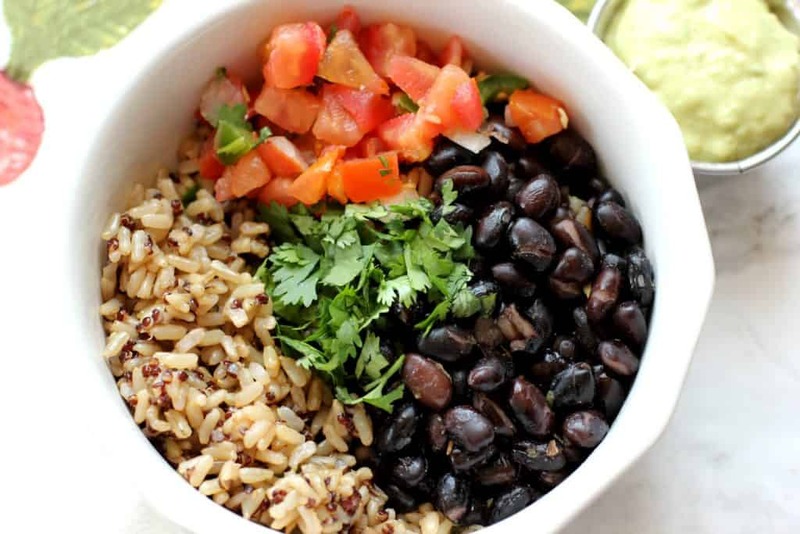 These burrito bowls aren’t just delicious, they’re SO EASY. You’ll literally have lunch ready in 15 minutes flat, I promise! Plus, you’ll want to eat the avocado lime sauce off a spoon. In a small pot, add the beans, cumin, oregano, and salt and bring to a bowl. Let the beans simmer for 5 minutes. In a small dish, mash the avocado and stir in the lime juice. Stir in the mayo and add a pinch of salt. Microwave the rice for 1 minute. Add the rice into the bottom of the bowl, top with beans and pico de gallo, then drizzle on the avocado sauce. You could obviously add any of your favorite toppings to this. Cheese, sour cream, salsa, etc. I had mine with a little bit of the avocado lime sauce drizzled on top and that was all I needed! Of course, I scooped up some of my bowl with chips… because that’s the best part of a burrito bowl! This post was sponsored by Minute® Ready to Serve Organics. All opinions are my own. Thank you for supporting the brands that I know and love! What’s your favorite burrito bowl topping? 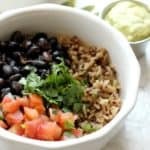 Love burrito bowls – and especially how easy they are to make! I really love when you give simple recipe ideas like this! I was just thinking about how my regular rice bowls needed a shake up, but I’m not the most daring or experienced cook. I hadn’t seen these products yet, so I’m excited to put them on the roster! I love minute made rice (sooooo convenient as a college student) and this looks absolutely SCRUMPTIOUS! Sounds fantastic! I’m loving that avocado sauce! So simple and so delicious (I am pretty sure about it). YUM! Mmmh, you really have me craving a burrito bowl right now. Honestly, I’d have them more often if cooking the grains didn’t take preplanning. So while I’m not a fan of the added plastic waste, the idea of microwaveable grains is great. We don’t have that kind of product over here, though, or I’d give it a try :). These bowls look awesome! I think I’d put that avocado lime sauce on everyyyything! What a great idea for a healthy and quick meal. I love that you used Minute rice for extra ease. I am going to have to try this. Thank you for sharing! Yummy! That rice looks fabulous. I love how easy it is to use. My favorite! Delicious + healthy = perfect! Oh, and it’s so pretty! Wow, brown rice and quinoa blend ready to serve…it doesn’t get much easier than that! Thanks for the heads up on that lovely product find! Can’t wait to try this burrito bowl! I am violently allergic to cilantro so I usually don’t even think about things like burrito bowls, but the good thing about making them at home is they would be safe for me to eat. This looks fabulous! I love that you use minute rice. It makes it so much easier and super fast because you are right. Who wants to spend time chopping, and cooking after a hard day! Great recipe and I can’t wait to try it! I love those recipes which are easy to whip up yet full of goodness, pinning your recipe! I need to get my hands on those packets. This is my kind of lunch. Healthy, warm and quick. What a quick, easy, delicious meal! I haven’t tried the quinoa and brown rice mix! Sounds great! This is such a perfect meal for summertime! 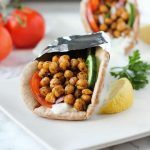 Quick, easy, and healthy! Such a palatable recipe, Liz! 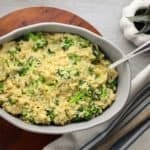 Can I use long-grain rice instead of brown rice for this recipe? This is a great idea–I need all the quick ideas I can get these days with a newborn! 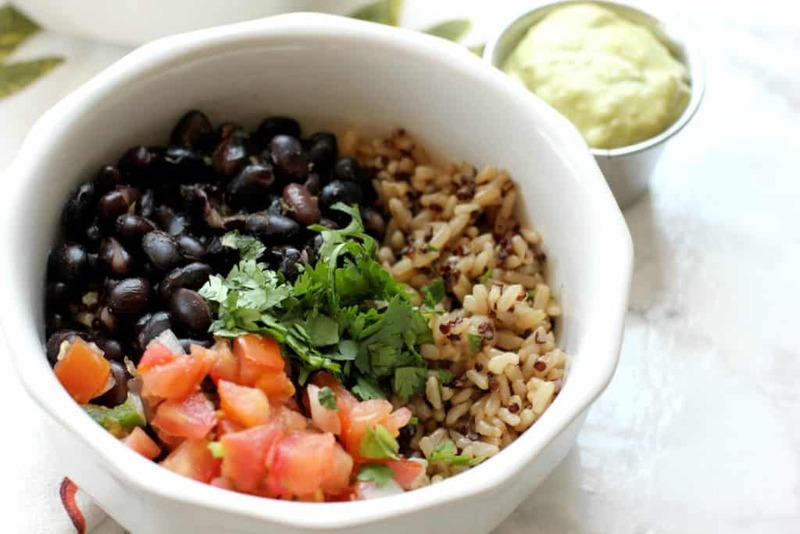 I love topping burrito bowls with avocado, cilantro, and salsa! wow, this is fast and easy but has amazing flavors. what a great work day lunch, it looks so good. Yum! This looks so good! Definitely need to make it. SO quick and easy, yet tasty and nutritious at the same time! I can see this being a go-to meal for college students! Great idea! 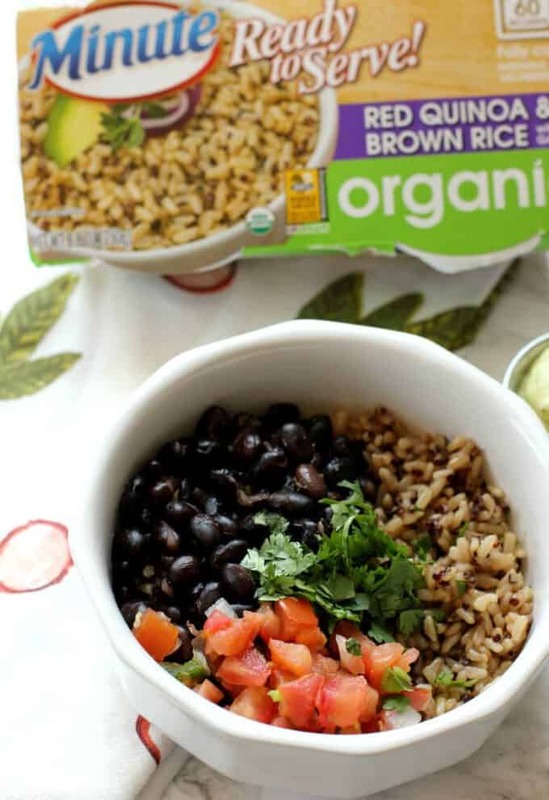 Quick and easy is always a good thing and I love how you’ve taken advantage of these brown rice instant packs. Looks so delicious and I’ll be taking advantage of this recipe. I love this recipe because it includes everything I already have in my kitchen but that avocado lime sauce looks amazing.